However, returning to home markets often presents challenges, as workers confront harsh realities such as corruption, redtape and inflexible labour markets. To climb the corporate ladder, diaspora workers are often compelled to cope with these failed institutions by conforming to the status quo rather than by instigating institutional reforms. As a result, developing countries that fail to improve institutional quality are at risk of wasting the returning talent and of hindering the local economy’s competitiveness. For many of these skilled workers, the decision to move back to their home developing country is driven in large part by a combination of grim prospects in developed markets and a rather optimistic outlook in developing countries. While advanced economies averaged annual GDP growth rates of 1,5% over the past 10 years, developing economies have averaged annual output at a multiple of four – which translated in even faster average wage growth that, depending on the job, sector and country, closed the relative income gap with similar jobs in advanced countries. Moreover, while advanced economies are struggling with an ageing workforce, which could be a drag on economic development, the reverse is happening in developing countries. According to IMF data, the number of sub-Saharan Africans reaching working age (15-64) will exceed that of the rest of the world combined by the year 2035. It is against this backdrop that the so-called “reverse brain-drain” has gained in significance over recent years and is poised to accelerate as the opportunity cost of working abroad flips in favour of working in a home country. While developing economies’ growth narrative allows for some optimism, poor institutional quality poses a serious threat. In countries where government plays a central role in resource capture and allocation, economies are distorted and as a result, talented young people are more likely to seek influential public sector positions as a way to exert impact, yield influence and maximize income than they are by seeking private sector employment or by becoming entrepreneurs. This is mainly due to workers’ inherent pursuit of income optimization in a context where they are unable to create economic profit autonomously without securing the right support from government sponsors. In other words, the government makes the business, rather than business making the business. In these developing economies, labour income is relatively low, markets are heavily regulated, and successful business people have strong links to – or are in – government. Competition is skewed in favour of those who derive their competitive advantage from regulatory protection and exemptions. Weak institutions, as reflected by poor governance at the state and parastatal levels, create incentives for even the most ethical person to conform to the system, as they seek to achieve a balance between wanting to contribute to their home country, generating an adequate income level in line with their corresponding skillset, and integrating the elite circle of decision-makers who operate within local standards of ethics. In regions where such stark income disparities are at play, where poverty is so prevalent, and where social pressure from the community (relatives, hometown/village folk) is so significant – as is their dependence on the worker’s success – returning workers face enormous challenges. Many find themselves struggling to find a balance between their “righteous” value system nurtured in relatively well-structured contexts of the “north” and the lopsided incentives they find back in the “south” as they compete for leadership roles. Due to the large privileges afforded those who rise up the public sector ladder, people who choose to conform to the status quo are more richly rewarded than those who choose to instigate reforms. This vicious circle either “kills” talent, or turns it away. According to the Global Competitiveness Report, competitiveness is “the set of institutions, policies, and factors that determine the level of productivity of an economy, which in turn sets the level of prosperity that the country can earn”. 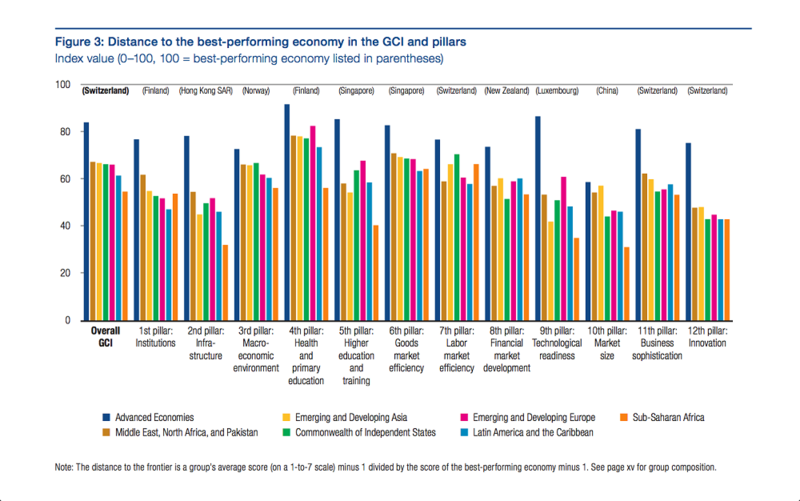 Advanced economies rank first along each and every measure of institutional quality, while Sub-Saharan African and Latin American & Caribbean economies consistently rank at the bottom. Institutions need to be reformed to align social and economic progress of a nation with talent integration, utilization, promotion and performance. More specifically, the reforms need to address formal institutional failures such as corruption, rigid labour markets, weak property rights, agency problems, underdeveloped capital markets, and political instability, as well as informal institutions such as culture, norms and socially shared values that inhibit talent promotion and performance. In some countries, certain dimensions of culture such as power distance, masculinity versus femininity, and age as a form of authority, weigh in negatively on a worker’s ability to reform, rather than conform to the status quo. Suggestions for reforms can be drawn from institutional theories and elements that pertain to the agency dilemma, while others can be sourced from theories about motivation. Institutional reforms include the need to transfer the bulk of the profit pool from the public sector to the private sector. Realizing such income transfer would make labour markets more efficient, as it would properly align interests for workers seeking to contribute to the public good in public sector roles, while others would be directed to pursue their socially responsible profit-maximizing interests in the private sector. Counter-intuitively, many of the opportunities for generating impact and superior income are through public sector roles, rather than private sector work and entrepreneurship. It is therefore also critical to address the issue of weak property rights and underdeveloped capital markets, as it prevents any scalable and viable form of private sector and entrepreneurship development to take shape and attract expatriates seeking to return home. Any interest realignment would incentivize workers to choose their career path based on their motivation, skills and corresponding income expectations rather than based on where the rent-seeking opportunities could be maximized. Secondly, the compensation structure (fixed and variable) in senior public sector roles need to align with the level of responsibility as measured by the amount of resources (financial and human) managed and the expected contribution to GDP and to other indicators of well-being. Too often, senior government leaders are entrusted with the management of sizeable budgets, with minimal oversight, unclear objectives, little accountability and misaligned pay structures that distort their behaviours. It is essential to better address the agency dilemma in African and developing market economies by drawing on the core fundamentals of motivational theories. Insights in this regard can be garnered from the likes of Singapore, Hong Kong and the UAE, which arguably use expectancy and reinforcement theories well to direct behaviours towards desired outcomes. For example, the compensation structure of senior Singaporean government officials correlates with certain measures of growth and healthy public accounts management, as it would comparably be in the private sector. Thirdly, positive forms of reinforcement should be amplified in favour of individuals who help integrate returning workers. Again, relevant insights into reinforcement theory could prove useful as a way to encourage government officials at all levels of the state to nurture rather than oppress talent. For example, the UAE Government has established a Ministry of Human Resources and Emiratisation that aims to ensure that educated UAE nationals are integrated seamlessly into the local workforce as they return home. Good talent workers should be recognized through media, awards and career promotions, but as much focus should be placed on recognizing the mentors who contribute to the promotion of these talent workers. Last but not least, government officials need to further decentralize decision-making powers to include the participation of diaspora workers in the goal-setting process. 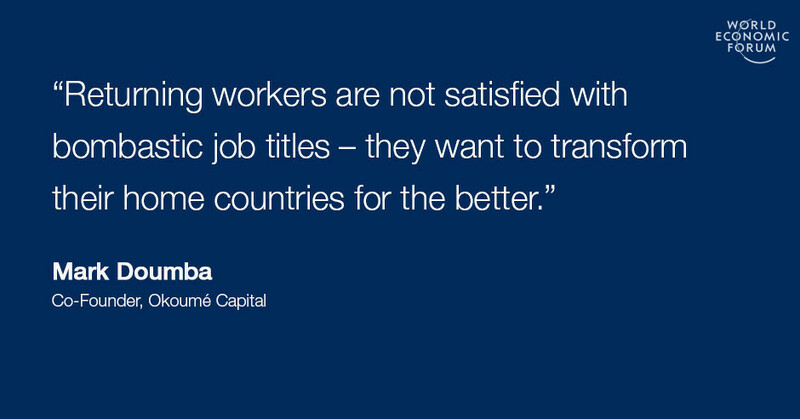 Returning workers are not satisfied with bombastic job titles – they want to transform their home countries for the better. For many of them, part of the motivation to return home is the desire to make a difference. For many African and developing market economies, the path to prosperity will depend largely on their ability to attract, retain and promote trained and educated diaspora and local talent. However, doing so in weak institutional contexts is complex due to the set of formal and informal factors that exert pressure on talent workers to adapt and conform to failed institutions rather than to reform them. The key to acquiring and retaining talent is to create a local context that is favuorable to reformists, or for which “conforming” refers to adhering to a positive value system that is based on strong institutions. Such reforms are possible by integrating and adapting key tenets of institutional and motivational theories to the local environment. In such a context, diaspora workers would be able to create value and apply their full potential at the service of their home market, in public and private sector roles, as proper incentives would be reflected across the key formal and informal institutions that govern these markets. However, failing to reform institutions for the better will have adverse effects on the “reverse brain drain” and will lead to talent waste and human capital flight that would be detrimental to the fundamentals of competitiveness that are central to the prosperity of developing market economies.